Porsches and Ferraris make their annual visit to Castle Combe on Bank Holiday Monday 29 August for the A Plant Lux Traffic Controls Race Day, but it's the circuit's own three championships where local drivers will be making the impact. Proving they can build and run the fastest car, regardless of what is thrown at them, is the Swift Cooper team, based on the doorstep of the circuit at Yatton Keynell. After the loss of their driver, Peter O'Shea, at the last meeting, the understandably subdued team bounced back and came away with a win and a second place for its championship leading driver, Rob Hall. Moreover, their other pilots, Nathan Ward from Coventry and Luke Cooper, son of Swift Cooper boss, Alan, came away with a 2nd and 4th in class respectively, all the cars bearing the name of their former team mate. Carrying on into this event will be the battle between Hall and 2009 champion, Ben Norton, from Bratton. When Hall's car is perfect he may just have the edge, but has to temper this against Norton's ability to drive flat out, with no regard to points, given his late arrival to the contest this year. With two rounds to go, Saltford's Steven Jensen needs to regain the form which saw him take double victories earlier this year. Valuable points were lost to Hall after his airborne excursion from the last meeting in the Gloucester based Kevin Mills Racing Spectrum, but thankfully no bones were broken. Another local driver with considerable speed is Bradford on Avon's David Vivian who picked up the two class B wins and the 'Driver of the Day' award last time. He still has to close the gap on Chippenham's Adam Higgins who took a second and a third and will fly if there is any sign of rain. Melksham's Ed Moore and Langford's Roger Orgee are class A contenders looking for some smooth running, whilst Bath's Chris Acton, the former Pre '90 champion, has one of his occasional outings in the Ray GRS08. There is likely to be some air of tension in the circuit's Saloon Car championship race after a controversial lead change at the last race. Adam Prebble (Southampton) had already won the first race in his Rover Turbo and was deposed in race two by Bridgwater's Tony Dolley in his 206 as they entered Bobbies, the pair differing in their view of the fairness of the pass. Although Dolley's overall title battle is not directly with Prebble or any of his own class A rivals, he still needs to beat them to stand any chance against Yate's Nick Charles, the runaway leader of class B in his rapid 106. After his gearbox problems last time, Nick Clark's overall title battle is over, as Charles has a points lead which cannot be overtaken in the two remaining rounds. Weston Super Mare's Will Burns and Ditcheat's Charles Hyde-Andrews-Bird will be eager to deny Clark points for the class D honours too. Bristol's Mark Wyatt will be interfering in the Dolley/Prebble battle again and looking to secure his second in class in his Astra. The ever changing position at the top of the circuit's Sports and GT championship is an ongoing fascination. Trowbridge's Andrew Shanley is this week's leader in the Radical Prosport after the demise of Simon Tilling's engine excluded him from the last race. Whilst Tilling has the pace to romp home clear when the gods look kindly upon him, Shanley is capable of raking in a good dose of points on a consistent basis, so the outcome is still far from settled. In the class for modified road based cars, North Wraxall's Ian Hall would welcome a little more competition for his Darrian Wildcat if only to strengthen his points scoring ability. Like Tilling, his car is quick enough to almost guarantee a win if all goes well, but the odd glitch has kept him just off the overall lead. Bath driver Guy Parr will be on a high after a second and third at the last meeting in his 2 litre Nemesis sports racing car, run by the Dursley based Wayne Poole Racing team. The Porsche Club championship races see a variety of both front and rear engined machines from the German manufacturer. Engine and transmission modifications are not allowed, with regular power checks to ensure compliance. Stuart Ings from Bristol is one of the drivers having fun in a Boxster in class 2. The Ferrari Owners Club has two races. The 'Open' caters for the modern machines such as 355, 360 & 430, whilst the 'Classic' allows cars built before 1990. David Hathaway from Chepstow is contesting both, using his 308 GT4 in the Classic and his F355 Challenge in the Open, in which he finished 5th at Zandvoort this year. Mike Reeder also has an F355 Challenge in the Open race along with fellow Pewsey resident Tim Ingram-Hill. Malmesbury's Pete Fisk in a Ferrari 328 GTB and Salisbury's Martin Hart in a Mondial are other West Country drivers in the Classic race. England's home grown sports car manufacturer, Morgan, has its own half hour race too. Bristol's George Martin is in his +8 after a 5th in class at Silverstone last time out. Keith Ahlers is usually the man to beat overall in his thundering 4.6 litre +8. The Trimarque challenge 20 minute race sees all three manufacturers lining up against each other, with many of those from the Morgan, Ferrari and Porsche races taking part. The day's action starts at 8.30 am with qualifying, racing getting under way from 12.30 pm. Admission prices are £15 for Adults, £7.50 for OAPs, £2.50 for Paddock Transfer, whilst accompanied children under 16 are admitted free. 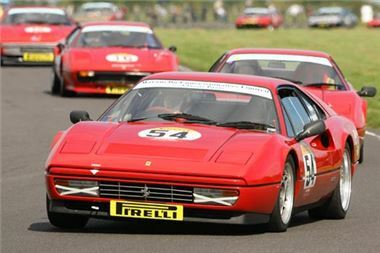 For further information, visit the Castle Combe Circuit website on www.castlecombecircuit.co.uk or on Facebook or Twitter.